So your dog and cat want a blog. Instead of referring them to wordpress.com, you offer to set it up for them and foot the $5 it costs to run the most basic of Digital Ocean droplets. You could get WordPress up and running by choosing an appropriate image or running it in Docker. But that would be too easy. Instead, you set a timer to see if you can set up WordPress along with nginx+PHP+MySQL on a fresh Ubuntu Server 16.04 installation faster than last month when you did it for your hamster. Leaving such a server unattended would be like leaving your child at a boarding school and never bothering to call and ask how they are. They probably are fine, but something might have happened and you wouldn't know. So it's a good idea to set up some basic monitoring for this server. Time to set a timer again to bring up an ELK stack for centralized monitoring? I mean, what if your cat's adventure blog takes off? You could but that's like hitting a nail with an ax at this point. Instead, you choose monit as the hammer. Instead of email, I want to receive alerts to my personal Slack team of 1. I like to use email for communication, not robotic messages. I've noticed that if I get too many alerts or reports in my email inbox, I tend to ignore them. Slack is free, you can create a team of just one member and there is an app for your phone if you also want push notifications. Make sure that you have a recent version. This tutorial was tested with 5.16. Monit configuration file is located at /etc/monit/monitrc. Like with Apache and nginx configurations on Ubuntu, /etc/monit/conf-enabled/ is supposed to contain symlinked files from the /etc/monit/conf-available/ directory. We are going to use the /etc/monit/conf.d/ directory for our configuration files. for multiple lines, cat << EOF ... EOF is more convenient than echo -e "lala\nlala"
Save the Webhook URL that you copied when you created the web hook. You can test it that it works by running the script. I have a blog post on how to perform an unattended installation of WordPress on Ubuntu Server. You can also configure WordPress with WP CLI or perhaps using PhantomJS. I believe it is useful take a moment and think about what should be monitored. The main purpose of this server is to serve the blog contents to its readers. If the blog is down, we are in trouble. If the site is slow, its visitors may leave and that should not happen either. Instead of monitoring the nginx, php-fpm and mysql processes, I propose that we check if the server is serving the blog content and whether it is not slow. I know that it is possible to write rules that will restart nginx if it goes down but if the nginx process goes down then there is something really wrong and it should be investigated instead of just restarted. I really liked this interview with Jeremy Edberg (first paid employee at reddit and now at Netflix) where he said that you should generally monitor the application metrics that matter to your business. This piece of configuration will periodically check whether the blog is up and running and will send us alerts if it is not. It will also check that the certificate is valid for at least 10 days. To prevent way too slow responses, we set a timeout of 1 second. Lastly, we verify that a string of our choice is found in the first 1 MB of the page. You can also use a regular expression. else if succeeded then exec "/usr/local/bin/slack.sh"
The else if succeeded bit is needed so that you also get an alert that the service is back up. When the blog reaches more than 2000 monthly visits, you can go and look for external monitoring solutions that will ping your service from all around the world. I am using the free version of monitor.us that checks my websites from Germany and the US and sends a weekly report of average request times and immediate alerts if the website is down. When you've run out of disk space, you will get all kinds of errors. Let's make sure that we are warned in advance when that is about to happen. if space usage > 80% then exec "/usr/local/bin/slack.sh" else if succeeded then exec "/usr/local/bin/slack.sh"
When you're running something as simple as a blog, the system should never run out of memory, start swapping or have a constant high load. If that happens, something is up. Even when the load is high or too much memory is being used, the website can still be working but it doesn't mean that the sever is healthy. That is why we have this additional check to warn about problems in advance. if memory > 80% for 2 cycles then exec "/usr/local/bin/slack.sh" else if succeeded then exec "/usr/local/bin/slack.sh"
if swap > 10% for 2 cycles then exec "/usr/local/bin/slack.sh" else if succeeded then exec "/usr/local/bin/slack.sh"
if cpu > 80% for 2 cycles then exec "/usr/local/bin/slack.sh" else if succeeded then exec "/usr/local/bin/slack.sh"
if loadavg (5min) > 1 for 2 cycles then exec "/usr/local/bin/slack.sh" else if succeeded then exec "/usr/local/bin/slack.sh"
Let's make sure that there aren't any common open ports that we don't to be open. This may accidentally happen during configuration changes or upgrades. Unfortunately, the syntax if port 21 then alert else if failed then alert does not work. But we can use netcat for this. This configuration example also shows how you can use your own scripts with monit. check program port21 with path "/bin/sh -c 'echo Port 21 is open ; nc -z $BLOGHOST 21 -w1'" every "5 * * * *"
if status != 1 then exec "/usr/local/bin/slack.sh"
check program port25 with path "/bin/sh -c 'echo Port 25 is open ; nc -z $BLOGHOST 25 -w1'" every "5 * * * *"
check program port3306 with path "/bin/sh -c 'echo Port 3306 is open ; nc -z $BLOGHOST 3306 -w1'" every "5 * * * *"
What I like about monit's configuration syntax that it is very readable. Stop the web server and see what happens. Alerts should be the way to go. But I also like to receive weekly reports about the server. 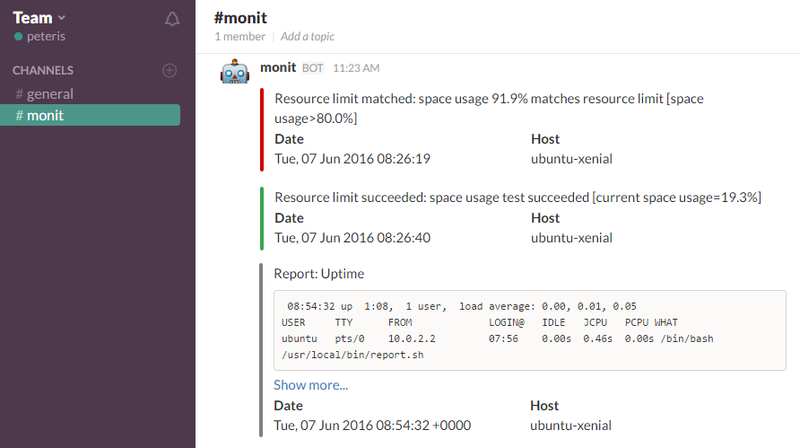 The reports contain information about uptime, disk space usage, available updates, open ports, etc. It's useful if you make changes to the server but forget something, you may notice something's wrong when you receive a report. Since reports are frequent you may suffer from report fatigue and stop paying attention to them, so it's important to summarize them and send them weekly or if that's too much then monthly. Note that I am using Markdown formatting in the script output. We can abuse our slack.sh script by using the $MONIT_ variables.